Raw sewage enters the plant at the Screening Building via a 42-inch diameter gravity sewer. A trash rack and three mechanically cleaned bar screens remove large solids (objects greater than 1/2â€) from the influent. The flow then passes through the grit channels located adjacent to the Screening Building. 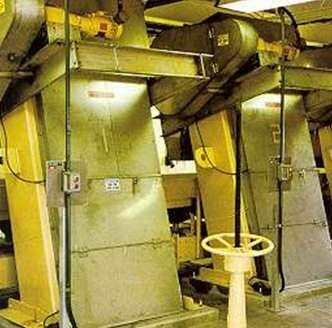 Heavy inert solids (sand, stones, grit) are removed from the grit channels by mechanical grit collectors and pumped to cyclone degritters and grit washers located within the building.